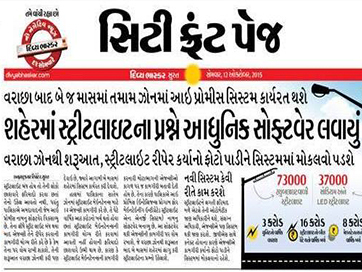 On 13th October 2015, we got featured on the front page of Divya Bhaskar, Surat Edition for introducing our iPromise solution in the city. The application will solve the problem of street lights of the city and maintain its health. The app comes with different modules like Preventive Management System, Breakdown Maintenance, Stuff Management, GPS Attendance Module, and Cloud-based Citizen Relationship Management (CRM) Module. The application has made it easy for officers to maintain and solve the problem of street lights of the city and maintain its health.